These cookies are just the perfect simple peanut butter cookies; perfectly peanut buttery, perfectly soft, perfectly dipped in a little milk. Today is National Peanut Butter Cookie Day! Until I became a food blogger I had no idea that there were national food holidays like this. I’m sure I heard of a few of them, like doughnut day and national ice cream month and such (Nate wouldn’t even let me get any doughnuts last week) But besides those I was clueless that there were other “national” food holidays such as national peanut butter cookie day! So I went through the list and saved the important holidays to my calendar. You know, things like national chocolate chip day and national peanut butter cookie day are totally important holidays! Right? Well these cookies are the perfect way for you to celebrate this wonderful holiday today. 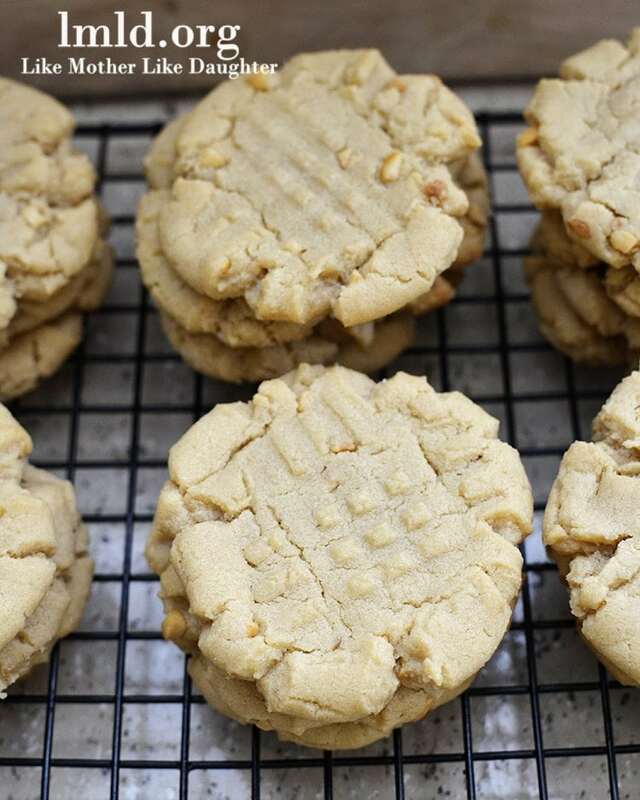 It is wonderful, because who doesn’t love peanut butter cookies?! These cookies are just the perfect amount of peanut butter flavor, soft, just a little crumbly and delicious dipped in milk! Cream together, butter shortening, peanut butter, and sugars. Add in each egg at a time, mixing in between. In a separate bowl combine the flour, salt, baking soda and baking powder. Slowly mix in the dry ingredients to the wet ingredients while stirring. Scoop tablespoon sized balls of cookie dough onto a cookie sheet and roll into balls. Slightly flatten the balls with a fork, making a criss cross pattern. Bake in oven for 9 minutes. Remove from oven and allow to sit on cookie sheet for about 5 minutes before removing to a wire cooling rack. Enjoy these cookies with a large glass of milk! Instead of using the butter and shortening mixture do you think using butter flavored Crisco would work? All shortening instead of half and half will definitely change the cookie, and I don’t know if I would suggest it, but you can try it… I think with the crisco your cookie might be more crumbly and it will probably make your cookie thicker. But I haven’t tried it out so I can’t guarantee anything… Let me know if you try it out, how it works for you! Sorry they spread out so much for you Ashley. I definitely think the amount of flour needed can change based on the ingredients used, but I am surprised the change was so much more! I am glad you made it work for you! They look incredible and just perfect! I have a recipe almost like this on my site (except it’s all butter rather than a butter/shortening combo). I love the hashmarks you made with the fork. I want to just chomp into one of these! Thanks averie. Coming from a peanut butter connoisseur like you, that means a lot!! Melanie, these cookies come out fairly soft. They aren’t quite as soft as a chocolate chip cookie, but they are no where near as hard as something like a short bread cookie. Ok great – thank you so much! It says 2 1/2 flour. Is that cups or TBS? Sorry Ashley, I will fix that. Its 2.5 cups! These look so delicious! I saw your post on instagram last week. I would really love it if we lived closer than an hour away so I could enjoy all these delicious treats you make! Thanks Kari! I wish we were neighbors so I could share my treats with you too! Now I’m craving them. I guess time to make me a batch of these cookies!! !